Any thoughts on the Bantha Stampede scene before I go on with the module? (I actually completed it today, so I will eventually post the whole report). They stayed in a state of paralysis. No one was doing nothing concrete. I started counting from 5 to 1. Good stuff! I love how you injected the tension! I thought to myself that this could be a good opportunity to teach a basic RPG lesson: "you must decide your actions quickly or s*** happens". Page 46 of the Core Rulebook, under Declaration: "Don't let them hesitate! If a player hesitates, so does his character. Combat in Star Wars is fast and furious. It's not a chess game, where the players can mull over their next move for hours." HEY, BTW, YOU DID SEE THAT FFG IS GOING TO REPUBLISH THE FIRST EDITION CORE RULEBOOK AND THE STAR WARS SOURCEBOOK TOGETHER, RIGHT???? I don't think so. They should learn from this. And, they know that they won't breeze through every encounter. They continued their travels by foot and meet the Sandpeople Ambush. They managed to trade like 10 blaster rifles (looted from dead bounty hunters from past fights) to get a free pass. This was a great relief for me as the GM, because a fight against 20 enemies would had been a dice rolling nightmare (one of the weaknesses of the d6 system IMO). 20 enemies is a lot for most RPGs. I know it would be a lot for my d20 3E based Conan game. 1. 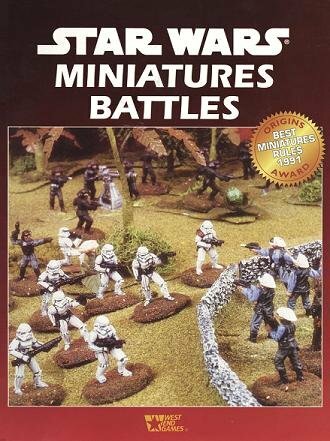 MASS COMBAT - In the past, I've switched to the Minitature Battles game and had a blast. I don't use real miniatures. I just use cardboard squares that I made. The mini rules really fit well with the standard combat system, and when I've played it in the past, switching between the two systems was seamless. But, the downside is that there is a small learning curve for using the mini rules. If you anticipate huge battles in the future, then you might want to look at getting this game. The rules really are superior--a breeze to play and have a very Star Wars large battle flavor. 2 - COMBINED ACTIONS. You can use the combined action rule. Instead of singles, have the Tusken's fight in groups of three (or even more). You've got 20 Tuskens. In groups of three, you've got two leaders, who will fight singly, and you've got 6 groups of three each. With the Combined Action rule, the Tusken groups will have one attack roll. Now, instead of 20 attack rolls for the Tuskens, you've got 8. You've got 6 groups of three--that's six attack rolls. And you've got 2 single leaders that fight normally as single characters. If you go to groups of 4, you can have 5 groups. That reduces you to 5 attacks (with Combined Action bonus) for the baddies. It makes it much more easy to manage. But, the group gets a bonus on their attack and damage due to the Combined Action rule. 3 - DRAMATIC NARRATIVE COMBAT. Another thing you can do is just consider that you have 20 total Tuskens to fight. Play the combat from the PC perspective only. Here, you describe the hilly, uneven ground of this part of Tatooine. If the characters are on a plateau and have long line of sight, then tell them what they see in their macro-binocs. But, handle the fight by just throwing a few of the total baddies at the PCs at a time--in waves. For grins, let's say the PCs are at a fence at the homestead. Describe the turmoil-all the massive numbers of Tuskens climbing up over the lip of the mesa. Screaming, they come running at the settlement or the homestead or the rock behind which the PCs are camped--however it works for your game. Throw, say, 2 Tuskens per PC at the players. As the players kill off the Tuskens or move, keep the drama up. Think of this like a movie. You're not up in the sky watching the entire fight. You're just down in the trenches with the main characters--seeing what they do. Keep track of how many the PCs kill. When you get to 20, the fight winds down. Describe other fights that the PCs can see--but they don't participate in those. It's just dramatic window dressing. You're describing a massive battle, but you're only actually having the PCs meet a few of the enemies at one time--so that it's not overwhelming to manage. You may even want to pre-dice some scenes between NPCs and Tuskens, if you want. Or, you can just describe it. Throw the heat on and let the PCs see the Tuskens win sometimes. "To your left, about 50 yards away, you see the Fallow family--the ones that owned the tap cafe in the village--fighting for their lives. A horde of Tuskens swarm over the homestead, in and out of its crevices. As you watch, the colored blaster bolts cease to emit from the above ground shutters. Fire licks up from the underground entrance. That mass of Tuskens are past the homestead now, disappearing behind Rosa's Mesa. And, you know that the entire Fallow family no longer lives. The Tusken's massacred them." "BLAM! THE GROUND JUST EXPLODES NEXT TO YOUR FEET. Your attention has lingered too long. Four Tuskens are approaching from the opposite direction, three on foot and one riding a bantha that is painted up with war stripes and wearing a hide and spike war harness!" Now, you do the battle with the four Tuskens. Another fight with a single Tusken that runs out from under cover. More description when the PCs have some line of site. Then do another skirmish with some more Tuskens. Make it frantic, dramatic, in the trenches fighting, both with what you throw against the players and what you describe to them. Hit them with the horror. The smells, the sights, the smoke--COMBAT! I've found from experience that the Dramatic Narrative method works best when the GM has a good idea of how the fight will go in his head. I will pre-plan this, putting the PCs in "decision spots" where, if the PCs are successful in an encounter, the entire fight goes good for their side. For example, "Because the PCs defended the water pump, the Tuskens could not get to it to spoil the water reserves." Know that, if the PC fail a that water pump battle, then the Tuskens advance on the map toward their goals (only the GM uses this map--using it to help him describe what the PCs see). If the PCs win at the pump, then that particular skirmish makes the Tuskens have to use "plan B", which means they turn and attack around the animal barn--where the NPCs will fight them (and that will become description). You can even rolls some quick dice for the NPCs. Over in the distance, five NPC farmers hold off seven Tuskens? No problem. Roll 1D for each person on each side. Roll 5D for the 5 NPCs. That's a combat round. For every 1 rolled, that person is killed or incapacitated. Do the same for the Tuskens. Roll 7D. Each 1 or 2 (the Tuskens are attacking and don't have cover) means that a Tusken drops. Let the dice decide how the encounter goes. If, on the first round, 2 NPCs drop, leaving 3. And only 2 Tuskens drop, then have those 3 NPCs retreat! Describe it in the player's minds eye! This can be a lot of fun, and an easy way to handle large combats. I think you handled it well. See above. 3 - DRAMATIC NARRATIVE COMBAT. BTW, the most successful narrative combats that I've run in the past where the ones where I took the time to outline the battle. I set up a flow chart. Each box was a cruch point where something had to happen with the PCs. Maybe they had to sneak past the enemy. Maybe it was a flat out battle. Maybe it was an ambush. I never showed the players this flow chart. It was just for me. I would describe what the players saw, heard, tasted. Each box on the flow chart, I pre-figured what would come next. If they failed the fight and were captured. That led to another box. If they retreated, that lead to another box. If they won the fight, that led to another box. I won't lie. These flow charts take time and a lot of pre-thinking. But, if they're done right, your battle goes extremely smoothly, and your entire game session is a success. I'd follow the flow chart, using it to help me decide what is next. Sometimes, I'd place hard-to-reach boxes on the flow chart, that, if the PCs did get to that box, they'd be extremely rewarded--like, maybe they find an E-Web blaster. Or, if they get through a particularly harrowing part where I set them up to fail--but they win in spite of that--the win line from that box will take them to a box where they all get bonus Force Points. Flow Charts are also great to manage chases, but that's another discussion.